Both Hong Kong and Vienna define themselves as ‘innovative’, forward-looking and business-friendly cities. Both are keenly interested in the creation of new, high value-added employment opportunities in new enterprises. This seminar and dialogue discussed approaches to help develop prosperous urban start-up ecosystems, which are also networked globally with similar cities. There was agreement that start-up companies can thrive only in a supportive urban environment in which public authorities also lend a helping hand. The speakers presented various initiatives facilitating start-up expansion and debated opportunities in Vienna and Hong Kong. Dr. Gregg Li Ka-lok, Chairman of Invotech HK, an organization dedicated to supporting innovation and entrepreneurship, admitted that the major challenge lies in bringing different groups (such as policymakers, entrepreneurs and academia) together for the purpose. He also listed nine areas of local urban development which could support an extended, long-lasting network of start-up companies, active both locally and in China or globally: (1) Smart Ageing, (2) Smart Food, (3) Smart SMEs / Mobile E-Commerce, (4) Smart Governance, (5) Smart Transport, (6) Smart Harbor, (7) Smart Fintech, (8) Smarter Citizens. Start-up businesses should be helped by experienced mentors to help accelerate long-term viability of the enterprise in the urban community. Mrs Ivana Bacanovic of the Austrian Business Service (AWS) in Vienna introduced the Global Incubator Network (GIN). GIN provides assistance to Austrian start-ups wishing to enter markets abroad, and to international start-ups intending to set up a European base in Austria. 7 out of 10 start-ups last year came in fact from Hong Kong. GIN provides start-ups with market information and contacts to potential partners and investors. It also organizes the goAustria and goInternational incubation programmes, which include mentoring and pitching opportunities. Mrs Bacanovic also discussed the importance of events bringing the start-up community and potential investors together, such as the Pioneers Festival in Vienna. Moreover, entrepreneurship programmes for university graduates are advisable. GIN supports only start-ups, which already have a marketable product or service. It then normally conducts a first feasibility study based on business plans and then hires a mentor for the start-up company. Measurable outcomes are expected from both the company and the mentors. In recent years, Vienna has emerged as a transnational centre for start-up business incubation for all Eastern-Central European countries (most of which are already member states of the European Union). Promising opportunities for start-up business development can be seen in the fields of sustainable energy supply, green and smart living, the trend towards Industry 4.0 (manufacturing), bio-technology, medical and health technologies (already good cooperation with universities) as well as Fintech development. With regard to Hong Kong, Mr. Charles Ng, Associate Director-General of Investment Promotion 2 at Invest Hong Kong, pointed out the city is known as a financial and banking hub and can therefore capitalize on its location and supreme infrastructure. So as to increase efficiency and customer satisfaction, the main sectors of the local economy (including insurance and health sectors) look for more cooperation with start-ups offering Fintech and cyber security solutions. Of particular interest at the moment is blockchain technology development. The proximity with Shenzhen as a manufacturing centre has the potential to leverage opportunities for development of Industry 4.0 and robotics. Other promising areas for start-ups lie in the development of new districts in Hong Kong, with an emphasis on business efficiency (Central Business Districts 2 and 3), the cultural sector (West Kowloon Cultural District), green, smart and sustainable living in the planned new towns as well as in the inner-city core, in transport systems and energy grid technology. Further development is expected in the health and care provision sectors (ageing population with – already – the longest average life span in the world). The recent decision of the Karolinska Institutet Stockholm to set up a commercial R&D centre for Regenerative Medicine in the Hong Kong Science and Technology Park demonstrates the city’s potential for further R&D and knowledge transfer between academic institutions, city and the business sectors. 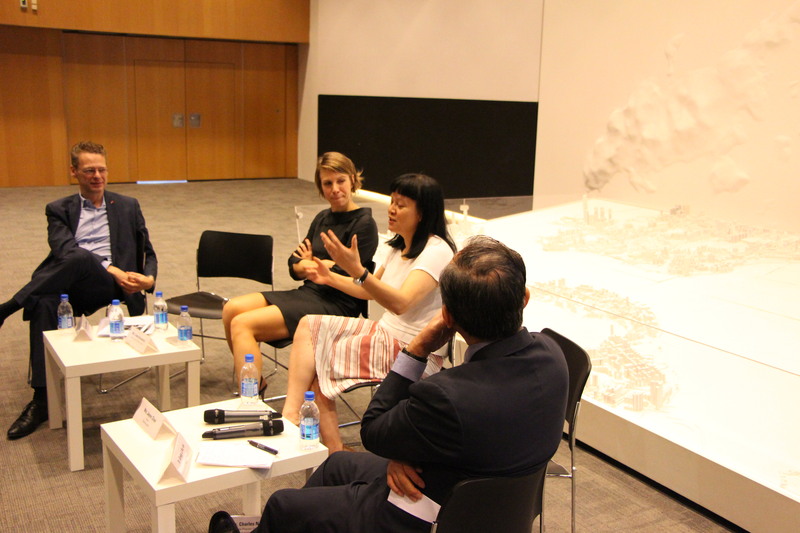 At the following roundtable discussion, the experts debated the situation of startups in the Hong Kong market, their internationalization, and the government support available. Mrs. Jayne Chan shared her experiences with development work for the Internet of Things/Internet of Everything sector in Hong Kong, the StartmeupHK programme and its annual StartmeupHK Festival. Challenges regarding Fintech regulations and market disruptions by new transport services like Uber, the government’s approach to innovation and the prospects for steadily increasing open access to big data were also discussed.